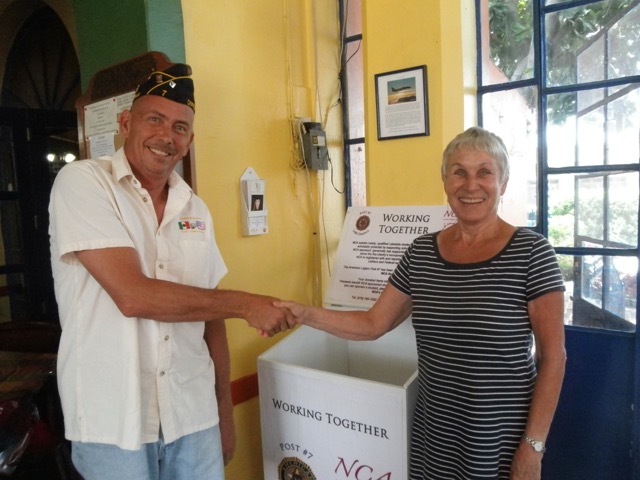 American Legion Post 7 Commander Timothy Stern and Lori Skoda, Niños de Chapala and Ajijic Bazaar Director seal their agreement to place a donation drop box in Chapala Post 7. There’s something new in the American Legion Post 7 in Chapala. 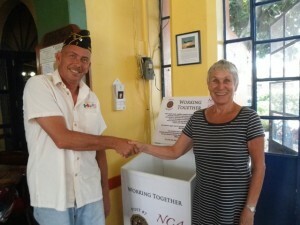 After the Legion Board agreed to install a large donation “drop box” to help support NCA (Los Niños de Chapala y Ajijic). Items collected in the drop box will be sold at the NCA Bazaar in Riberas del Pilar, with those earnings directed to supporting NCA office expenses and NCA student scholarships. This education-based charity is honored to join the lengthy list of the American Legion’s activities and charitable events. Some of the group’s dinners, parties and events raise money to help those who have served their country, others are scheduled to earn money to help the Lakeside community. NCA has a history of serving Lakeside youth since 1970, and has made it possible for several thousand disadvantaged but gifted Mexican students to remain in school. Alumni of the NCA program are now lawyers, doctors, accountants, marine biologists, teachers and engineers. Each year the number of students NCA is able to assist increases. Without increasing community support, it is highly unlikely that many of the outstanding young people currently in the program could have dreamed of a better future, and achieving their potential. It isn’t enough for NCA-sponsored students to be accepted into the program. The students and their parents agree to meet periodically with NCA staff to ascertain their need and their family support. Plus, students must maintain a grade average of 80% or better to remain within the program. Many work hard enough to consistently score in the 100% range. The linking of the Legion and NCA, two energetic, pro-active organizations with the welfare of all Lakesiders at heart, looks as if it could be a perfect match. The American Legion has made important monthly contributions to NCA for many years. Now these groups are working together, striving to leave things better than they found them, and to give back to Mexico in important ways while working to help transform the lives of those they serve. The success of NCA, lakeside’s oldest charity, owes much to the Legion’s generosity. The power of giving back and of paying forward is awesome, it has sometimes been described as “The Power of One.” Some wonder: what difference just one person can make. A glance at the Legion and NCA activities, many of which are created and carried out by a small group of individuals, shows that individual acts of kindness and compassion can be life-changing, and can make a genuine and lasting difference. American Legion Post 7 urges both veterans of all nationalities and non-veterans to visit and enjoy the many great meals and special events at the Post. For additional information , contact Commander Tim Stern via email: timstern1966@yahoo.com or Adjutant Vince Britton at vince_britton@yahoo.com.